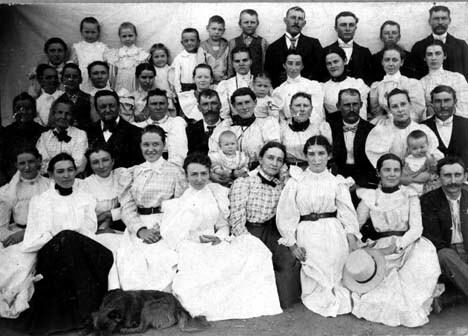 Families of Elverta, Sacramento County, California. The Strauch family came to the US, via Harve to NY. in June of 1858. They settled in American Twp. Elverta, Sacramento County in California (Map showing Elverta, CA). David STRAUCH was born 16 Dec. 1830 in Bayern. He died 5 Apr. 1896 in Elverta California. He married 13 Mar. 1850 in Bayern to Magdalena "Lena" MILLER. She was born 1830 in Bayern. She died 15 Oct 1897 in Sacramento County California. "STRAUCH, DAVID was born December 16, 1830, in Bavaria Germany, where he learned and followed the shoemaker's trade. Here he married Miss Lena, daughter of John P. Miller, of Bavaria, on the 13th of March 1850, in 1858 they left Germany for the United States, landing in New York in June, thence via the Isthmus route to California. They have had thirteen children....Since his arrival in California, Mr. Strauch has been engaged in farming and dairying. He owns a farm of eleven hundred acres, about nine miles from Sacramento, on the road to Marysville. The grape is cultivated for his own use only. He keeps a dairy of sixty to one hundred cows. " Victor Freidrich STRAUCH b. 23 Jul 1851 Bayern, d. Sac. Co. CA; m 8 Dec. 1872 in Sacramento, CA to Emma STEINMULLER b. .
John Peter STRAUCH b. Dec. 1857, Bayern; m circa 1883 in Sac. CA to Elizabeth F. SHANDONEY b. 5 Apr 1865, CA, d. 31 Mar 1952, Sac. CA. Christina STRAUCH b. 14 Dec 1858, Elverta CA, d. 9 Nov. 1859, Elverta CA. Mary STRAUCH b. 21 Oct 1860, Elverta CA; d. 8 Oct 1862, Elverta CA. Jeanie May STRAUCH b. 29 Oct 1862, Elverta CA; m 1st. Thomas W. JOHNSTON, 2nd. C. B. JONES. Rudolph William STRAUCH b. 22 Dec 1864, Elverta CA, d. 15 Apr. 1962 Sac. CA; m Mary. Charles Christopher STRAUCH b. 10 Apr. 1867, Elverta CA, d. 21 Jan, 1958, Sac. Co. CA. m 6 Jun. 1897 in Sac. CA to Lena C. WOLFE b.16 May 1878 CA, d. 1 May 1878 Sac. CA. Emma Caroline STRAUCH b. 11 May 1869, Elverta CA, d. 7 Sep. 1942 Rio Linda, CA; m 10 May 1905, Sac. CA to John J. WOLFE. Gustave Anton STRAUCH b. 12 Mar. 1871, Elverta CA, d. 23 Feb 1951, Sac. CA; m 8 Feb. 1900 in Sac. CA to Henrietta W. GERHARDT b. 3 Apr 1879, CA, d. 12 Feb 1951, Sac. CA. Charlotte Julia STRAUCH b. 13 Jun. 1874, Elverta CA, d. 6 Dec. 1876, Elverta CA. Annie May STRAUCH b.10 Aug. 1876, Elverta CA, d. 1967, Elverta CA; m 21 Feb. 1900 in Sac. CA to August WOLFE. "1870....The original school house was a one-room wood building. Naturally there was no electricity or plumbing. It is said that very few of the student could speak English because the predominant language was German. Some of the old families who had children in the school were the Scheidels, the Charles Schmittmeyers and David Strauch. In 1897 the school house was moved to an acre of land donated by V. F. Strauch located on the corner of Elverta Road and Elwyn Ave. In 1911 a new and larger school house was constructed on the same site. In 1920 a new school was built on the present site on Rio Linda Blvd., and the old school on Elverta Road was later used for other purposes....."
9638 STRAUCH, Gustav Antony 21 5 61/2 Light Brown Light Blank California Sacramento County 34 4 blank Sacramento Sept 10, 18?? 9639 STRAUCH, Charles Christopher 26 5 61/2 Light Gray Brown Blank California Sacramento County 34 4 blank Sacramento Oct 1, 18?? 9640 STRAUCH, David 61 5 5 Florid Gray Gray Blank Germany Sacramento County 34 4 Oct 3, 1868, Sacramento co Sacramento Aug 27, 18?? 9641 STRAUCH, Rudolph William 28 5 51/2 Light Gray Brown Blank California Sacramento County 34 4 blank Sacramento Oct. 1, 18?? 9642 STRAUCH, Vicror Frederick 42 5 21/2 Light Blue Brown Blank Germany Sacramento County 34 4 By vertue of father's naturalization Sacramento Sept. 24, 18?? Johann Peter Mueller was born, 5 February 1797 in Kusel, Pfalz, Bayern. He married, 21 July, 1825 in Neustadt Haardt, Pfaltz, Bayern to Amalia Luisa Koch. She was born 17 October, 1791 in Neustadt, Pfaltz, Bayern. Magdalena "Lena" MILLER b.26 Jan. 1830, Neustadt Haardt, Pfaltz,Bayern, d. 15 Oct 1897 in Sacramento County, California; David STRAUCH. Victor Freiderich MILLER b. 10 Aug. 1831, Neustadt Haardt, Pfaltz,Bayern, d. 26 Sep. 1916 in Sacramento County, California; m 14 Aug. 1862 to Mary Jane CONNERTON, b. in Ireland, d. 7 Apr. 1888 in Sutter County, California. Lena MILLER b. 27 Jun 1863, CA, d. 5 Jan, 1946, CA. William MILLER b. 17 Jul. 1864, CA, d. 22 Jun, 1913; m 7 Jun, 1913, CA, to Mathilda STEWART. Frank MILLER b. 14 Dec. 1867, CA, d. 14 Ap. 1942. Elizabeth MILLER b. 8 Mar. 1869, CA, d. 28 Nov. 1952; m 19 Jun 1889 to Edward A. WRIGHT. Albert MILLER b. 10 Feb. 1871, CA, d. 14 Sep. 1943; m 9 Mar. 1898, CA, to Bertha WESSING. Mary Louise MILLER b. 16 Dec 1875, CA, d. 18 Apr. 1912; m 24 Feb. 1898 to Bert DONALDSON. Jennie MILLER b. 11 Sep. 1879, CA, d. Sep 1967; m 30 Mar. 1898 to Arthur MAHON. Victor Freiderich MILLER b. 24 Apr. 1883, CA; m 23 Mar 1909, Lyla GUILIFORD. A History of the New California" by Leigh H. Irvine, Vol. II, P.1079. The history of California as the state of to-day began in 1849 and 1850, when from the central and eastern portions of this country men of enterprise individuality and strong purpose made their way by land or water to the Pacific slope, there laying the foundation for the present development and advanced position of this commonwealth. It is now an honor to be numbered among these early pioneers, the honor to which Mr. Miller is entitled. He is a native of Bavaria, Germany, born August 10, 183l, a son of John P. and Louisa (Koch) Miller also natives of Bavaria, and there the mother spent her entire life. In 1850 Mr. Miller came across the plains with mule teams, leaving St. Louis, Missouri, on the 29th of April, 1850, and arriving at what was known as Hangtown, but now Placerville, August 25, following. He at once cast in his lot with the gold seekers, operating first in Placer county then in the southern mines near Jackson, also in the northern mines on Nelson's Creek, and was successful in his various ventures. Investing his earnings in a mule pack train, he was engaged in teaming to the mines for a short time, and subsequently embarked in agricultural pursuits on the Sacramento river, twelve miles above the city of Sacramento where he resided from 1852 until 1854, in partnership with Isaac Stone, conducting business under the firm name of Stone & Miller. In the latter year Mr. Miller sold his interest in the ranch to his partner, and then secured employment as a cook and manager for George Hardy, the proprietor of Mineral Point House on J street, between Sixth and Seventh, in Sacramento, where he remained for five years. In 1857 he sent for his father and the remained of the family to join him in America, he paying all the expenses of the journey. In the fall of 1859 Mr. Miller embarked in the dairy business in Sacramento, and while thus engaged the memorable flood of 1862 came and although this caused him heavy losses he persevered and continued in the business until in March, 1872, when he sold his dairy and turned his attention to other pursuits. From 1883 until 1898 he was a resident of Sutter county, California, engaged in dairying and the livestock business near Nicolaus, and in the latter year established his home in Sacramento county. His first residence in this county was on a farm west of and near Florin, where he was successfully engaged in agricultural pursuits for many years, but in 1904 he took up his abode in Oak Grove, his pleasant and commodious residence being located at 207 First Avenue, where he and his daughter are spending their days in the quiet enjoyment of the fruits of former toil. He, however, still own a firm in Sutter county, consisting of eight hundred and seventy-three acres of rich and fertile land. Mr. Miller was married August 14, 1862, to Mary J. Connerton, a native of Ireland, and they had eight children, namely: Lena, at home; William, in Sutter county; Frank, who also makes his home that county; Elizabeth, the wife of E.A. Wright, of Sacramento county; Albert, a resident of Sutter county; Louise, the wife of B. Donaldson, of Reno, Nevada; Jennie, the wife of Arthur Mahon, of Sitter county; and Victor F., Jr., at home. The cause of education has ever found in Mr. Miller a true friend, and while residing in Sutter county he served as trustee of the Lee school district, and also held the same position in the American River school district; He gives his political support to the Republican party, and is a staunch advocate of its principles. He is one of the honored and highly esteemed citizens of his community, and it is safe to say that no man in Sacramento county has a wider circle of friends than Victor F. Miller. John STEINMILLER was born in 1802 in Germany. He died on 28 Jun 1879 in Sacramento County, California. He was Naturalized on 6 Sep 1845 in St Louis. Missouri. According to the 1860 US Census his mother may have been Louisa who was born about 1780 in Germany - or - she was his wife with the wrong age. Louis had two posably three sons in Sacramento. 1a) Louis Henry STEINMULLER was born on 16 May 1852. He died on 23 Aug 1915 in Sacramento County, California. He married on 6 Nov 1878 in Sacramento County, California to Laura A. NOLAN. She was born in Apr of 1852 in Massachutetts. She either died before 1900 or was in Prison (in Sacramento) in 1900 and the Stockton Mental Hospital in 1930 (1900 & 1930 US Census records). I cannot find the family in the 1880 census. 1a1) James A. STEINMILLER was born on 9 Jun 1879 & died on 21 Dec 1879 in Sacramento County, California. 1a2) A son was born on 11 Nov 1880 in Sacramento County, California. 1b) Emma STEINMILLER was born in Mar 1855 in California. She died on 15 Feb 1933 Sacramento County, California. She married on 8 Dec 1872, Sacramento County, California to Victor Freidrich STRAUCH. He was born on 23 Jul 1851 in Neustadt Haardt, Pfaltz, Bayern. 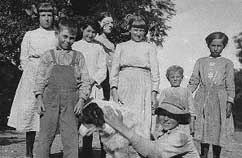 They had thirteen children all were born in Elverta, Sacramento, California. More on this family below. 1c1) Julia KROMER was born on 11 May 1876 and died on 11 Feb 1919 in Sacramento County California. 1c2) Mine KROMER was born was born on 28 Jun 1879 and died on 3 Jul 1887 in Sacramento County, California. 1c3) George John KROMER was born on 15 May 1881. He died on 4 Apr 1960 in Sacramento County, California. He married in 1920 in Sacramento County to Mae E Jones. She was born about 1890 in Nebraska. 1c4) Rosalia KROMER was born on 17 Jul 1883 and died on 7 Jul 1887 in Sacramento County, California. 1c5) Blanche KROMER was born on 3 May 1888 and died on 7 Jun 1891 Sacramento County, California. 1c6) Freddie KROMER was born about Aug 1886 and died on 11 Mar 1887 in Sacramento County, California. Louisa Elizabeth married 2nd on 21 Jun 1857 in Sacramento County, California to John Charles HARMS. He was born on 11 June 1830 in Hanover, Germany. He died 11 November 1885 in Elverta, Sacramento, California. Dora HARMS b. Jun 1861, Elverta, Sacramento Co., CA, d. 27 Aug 1868, Elverta, Sacramento Co., CA. She died from burns. Charles HARMS married 2nd on 14 Nov 1869 in Sacramento California to Anna Magdalena "Lena" DEXHIEMER. She was born on 21 Feb 1835 in Biebelnheim, Rheinhessen, Hessen, Germany. More on this family on the HARMS page. 2) Louis STEINMILLER was born about 1927 in Germany. He died on 24 Feb 1869 in Sacramento California. He married Louisa. She was born in 1834 in Germany. She died on 4 Jan 1863 in Sacramento, California. 2a) Henry STEINMILLER was born on 16 Jul 1855 in California. He died on 28 Nov 1898 in Vacaville, Solano, California. 2b) L STEINMILLER. She born about 1857 in Sacramento County, California. 2c) George STEINMILLER was born on 27 Mar 1859 in Sacramento County, California. He died 2 Sep 1944 in Solano County, California. He married Clara Belle ROCKWOOD. She was born on 4 Oct 1862 in Wilson County, Kansas. She died on 1 Oct 1935 in Solano County, California. 2c1) George C. STEINMILLER was born in 7 Dec 1883 in Sacramento County, California. He died on 26 Feb 1956 in Washoe County, Nevada. He married 1st in 1907 in Sacramento County, California to Alice M. DRAY. She was born about 1879 in Sacramento County, California. She died in Reno, Washoe, Nevada. They had a daughter 2c1a) Helen STEINMILLER. She was born on 29 Oct 1911 in Nevada. She died on 6 Mar 2000 in Reno, Washoe, Nevada. She married on 10 Sep 1938 in Reno, Washoe, Nevada to Edward Shier PARSON. He was born about 1907 in Nevada. George C married 2nd in 1938 in Washoe County, Nevada to May A. 2c2) Clara Belle STEINMILLER was born on 29 Oct 1888 in California. She died on 27 Apr 1978 in San Rafeal, Marin, California. She married Albert Olif BOTTLESON. He was born on 23 Apr 1885 in Utah. He died on 5 Jun 1945 in Solano County, California. They had a son 2c2a) Albert Olif BOTTLESON. He was born on 5 Dec 1915 in Solano County, California. He died on 9 Oct 1971 in Marin County, California. 2d1) Vernon John STEINMILLER. He was born about Jan of 1892 and died on 28 Apr 1892 in Sacramento County, California. 2d1a) Lucile J STEINMILLER. She was born on 28 Feb 1902 in Oxnard, Ventura, California. She died on 24 Dec 1995 in Los Angeles, California. She married Harold HOPPER. 3a) Mary Elizabeth STEINMILLER was born on 28 Jun 1867 in Placer County, California. She died 24 Oct 1896 in Placer County, California. She married Charles J McDONALD. He was born about 1859 in California. He died about 1929 in Placer County, California. They had two daughters: Florence McDONALD born about Feb 1889 in Placer County, California. She married in 1916 to Ethan WELLS in Sacramento County, California. Bertha McDONALD was born about Dec 1895 in Placer County, California. 3b) Louisa Cecilia STEINMILLER was born about 1869 in California. Joseph & Mary (WEBER) Wolfe both died in 1881 in Sacramento County, CA. All their children were born in Elverta CA. They had 6 children who were raised by Mary's mother Elizabeth (Jugal) WEBER. William T. Wolfe had two daughters Blanche & Evelyn both born before 1921. Mathias Wolfe b. circa 1867, d. before 1904. John J. Wolfe b. 1873, d. 1952, Elverta CA; m 10 May 1905, Sac, CA to Emma Caroline STRAUCH. August Wolfe (pictured at right) b. 20 Nov. 1874, d. 25 Feb. 1950, Elverta CA; m 21 Feb. 1900, Sac. CA to Annie May STRAUCH. Lena C. Wolfe b. 16 May 1878, d. 24 Aug. 1945, Elverta CA; m 6 Jun 1897 in Sac. CA to Charles Christopher STRAUCH. Francis J. STRAUCH b. circa 1879; d. before 1904. History of Sacramento County California with Illustrations 1880, Thomson & West. p.246 American Township. "WEBER, MRS. ELIZABETH lives eight miles from Sacramento, which is her Post Office; was born in Germany in 1825, and lived there until 1854; she emigrated to the United States in that year and came to California; she owns one hundred and sixty acres of land, which is well located; she has a vinyard and sistillery in connection with her farm; her land and improvements are worth about $6,000. She was married in 1864 (her maiden name being Jugal) to J. Weber, and by whom she has had two sons and four daughters - all living. Mr. Weber died in 1878." John WEBER b. 1815 Pru, Germany, d. 25 Jun 1878, Elverta CA; m Elizabeth JUGAL b. Pru Germany, d. 24 Dec. 1890, Sac. County, CA. Mary Weber b. circa 1854 in CA, d. 1881 in Sac. County, CA; m Joseph Wolfe. Augustus WEBER b. 29 Sep. 1858 CA. Lena WEBER b. circa 1861 CA. Joseph WEBER b. 1864, Elverta CA. Louisa WEBER b. 1866, Elverta CA. Anna WEBER b. circa 1870, Elverta CA. Agriculture forms the principal occupation of August Weber, and the wide-awake manner in which he takes advantage of all methods and ideas tending to enhance the value of his property has had much to do with his obtaining the competence which he now enjoys. Personal popularity results from the industry, perseverance and close and close attention to business which a person displays in management of any particular branch of business, and in the case of Mr. Weber this is certainly true, for he has closely adhered to the above mentioned pursuit, and he has gained the high esteem of all. Hisproperty consists of one hundred and sixty acres of rich and well improved land in the northern part of Sacramento county. Mr. Weber was born in the county in which he still resides, on the 29th of September, 1858, and is the son of John and Elizabeth Weber, who were natives of Germany and well known pioneers of Sacramento county. They came to this state by the isthmus route in the '50s, and for a time made their home on the Haggin Grant, but in 1862 took up their abode on the ranch now owned by their son August, where the father died on the 25th of June, 1878. The mother survived for many years, and passed away in the city of Sacramento, December 24, 1890. Of the children born to this worthy couple three are now living, August, Louisa and Annie, all residents of Sacramento county. August Weber was reared to man's estate on the old homestead farm, and his educational training was received in the Oak Grove public school, where he prepared for life's active duties. As a life occupation he chose that of a farmer, and has been successful in his ventures in this direction, also doing much toward developing the agricultural interests of his community. He has never sought or desired the emoluments of public office, preferring rather to give his undivided attention to his business interests, but as a citizen he is public-spirited and progressive, and every movement intended to prove of public benefit receives his hearty support and co-operation. For three years he has served as a trustee of the Oak Grove school district. All were born in Elverta CA. Louisa STRAUCH b. 1873; BASLER? George A. STRAUCH b. Feb. 1876, d. circa 1939, Sac. SA; m before Dec. 1922 to Hazel b. 15 Apr 1886 CA, d. 13 Apr 1975, Sac. CA. Lena STRAUCH b. Jul 1876; m before Dec. 1921 to MOHR. Elizabeth STRAUCH b. 10 May 1878, d. 18 Nov. 1880, Elverta CA. Emma STRAUCH b. Oct 1879. Rosa STRAUCH b. Apr. 1882. Flora M. STRAUCH b. Oct. 1883; m 15 Nov. 1904 in Sac. CA to Frederick W. WESSING. Victor Frederick b. 15 Mar 1886, CA, d. 3 Nov 1953, Sac CA; m HALLEWELL. Walter William STRAUCH b. Feb. 1888, d. 15 Dec. 1959, Elverta CA; m before Dec. 1921 to Ethel L BURRESS. Alice A STRAUCH b. Oct. 1890. Elmer J STRAUCH b. Aug. 1892. Lottie C. STRAUCH b. Feb 1894. Leona A STRAUCH b. Dec. 1896, d. 4 Aug. 1897, Elverta CA. The families of Victor F. and Emma (Steinmiller) Strauch, Rev. Charles F. Oehler, and Lena Harms. Picnic of Confirmation Class 1898, Elverta, Sacramento County, California. Victor F. Strauch was reared to man's estate in Sacramento county, receiving his early education in the Lincoln school district, but the knowledge therein gained has been greatly supplemented in the passing years by broad reading and experience in the practical affairs of life. From an early age he has been identified with agricultural pursuits, and he is now the owner of a ranch of five hundred and ten acres of rich and fertile land. In connection with his active business career he has also discharged the duties of public office, for many years serving as a trustee of the Lincoln school district, and much of that time has been spent as clerk of the board. In this office he has discharged his duties with promptness and decision, proving himself to be a man of ability and trustworthiness. The marriage of Mr. Strauch was celebrated on the 8th of December, 1872, when Miss Emma Steinmiller, a native of Sacramento county, became his wife. She is a daughter of George Steinmiller, who was long an honored resident of this county, but is now deceased. Eleven children survive to bless the union of Mr. and Mrs. Strauch, and the family is highly respected in Sacramento county, where they have many friends. Mr. Strauch is a member of Schiller Lodge, I. O. O. F., at Sacramento, and his political affiliations are with the Republican party. The children of John Peter & Elizabeth F. (Shandoney) Strauch Arthur Melvin STRAUCH b.19 Nov 1887, Sac. CA, d.16 Jul 1955, Sac. CA; m Ila Mae Gosney, b. 12 Jan 1898, Lyonsville Tehema, CA, d. 8 Oct 1990, Sac. CA. .
George W. STRAUCH b. 11 Jul 1886, Sac. CA, d. 5 Jan 1949 Sac CA,; m Meta J.
Ernest Clement STRAUCH b. 20 Sep 1893, Nicolaus, Sutter Co CA, d. 12 Apr. 1958, Sac. CA; m Frances. Oscar STRAUCH b. circa 1910, Sac. CA. more info. on the SHANDONEY family of Elverta CA. The children of Thomas W. & Jeanie May (Strauch) Johnston Margaret JOHNSTON b. circa 1881. Steven JOHNSTON b. 10 Sep. 1882, Elverta CA, d. 11 Jan. 1899, Elverta CA. The children of Rudolph William & Mary Strauch Stella S STRAUCH b. 1 Feb. 1904, Sac. CA; m Emil F BAZLEN. Their son Roy F. BAZLEN was co-owner & general manager of Louis H. NICOLAUS Optical Co. He also married Marcelynn NICOLAUS (daughter of Louis Harrison NICOLAUS, son of Louis Theador NICOLAUS). Harold R. STRAUCH b. 28 Jan 1908, Sac. CA, d. 4 Dec 1970; m Dorothy. The family lived in Elverta & all the children were born there. To the right is a picture of the children with Helena NICOLAUS (middle, dark hair w/ponytails), circa 1912. Lillian A. STRAUCH b. 10 Dec. 1897; m BRENNER. David D. STRAUCH b. 22 May 1899, d. before 1945. Pearl M. STRAUCH b. 15 Aug. 1900; m Emil WERNSMAN. Ruby M. STRAUCH (twin of Pearl) b. 15 Aug. 1900, d. 14 Sep. 1958; m John W. HOEFLING Jr.
Eva STRAUCH b. 1908; m Odell JONES. Grace A. STRAUCH m MALONE. Bernice A. STRAUCH m LUX. This name is well known throughout Sacramento county, for here Mr. Strauch has passed his entire life, and here his parents lived for many years. He was born on the homestead farm where he now resides April 10, 1867, a son of David and Magdalena (Miller) Strauch, both natives of Germany. In the '50s the family left their little German home and crossed the water to America, and after landing in this country continued their journey by the isthmus route to California. They at once established their home in Sacramento county, and for a few years thereafter Mr. Strauch farmed on the Haggin Grant, subsequently taking up his abode on the ranch now owned and occupied by his son Charles in the northern part of the county, where his life labors were ended in death on the 5th of April, 1896, his widow surviving him but a short time and passing away October 15, 1897. The death of this venerable citizen caused profound sorrow throughout the county, for through long years of an honorable and upright like and kindly nature he had grown into the affections of his fellows to a marked degree. For a number of years he served as trustee of the Lincoln school district, and was a Republican in his political affiliations. Of the children born to Mar. and Mrs. Strauch eight are now living, namely: Vuctor F. and John P., both residents of Sacramento county; Jennie M., the widow of Thomas Johnston, formerly of Placer county; Rudolph, a resident of Sacramento; Charles C., whose name introduces this review; Emma C., of Placer county; Gustave, a successful agriculturalist of Sacramento county, and Annie M., the wife of August Wolfe, also of the county. Charles C. Strauch received his educational training in the Lincoln school district, and he is now serving as clerk of its board of trustees. His entire life has been spent on the old Strauch homestead, where his parents resided for so many years and which is endeared to him through childhood's associations. In addition to his general farming interests he also conducts a dairy and is extensively engaged in stock-raising. On the 6th of June, 1897, Mr. Charles C. Strauch was united in marriage to Lena C. Wolfe, also a native of Sacramento county, where she was born May 16, 1878, being a daughter of Joseph and Mary (Webber) Wolfe, the father a native of Germany and the mother of Sacramento county, California. Mrs. Strauch was but three years of age when her parents died, and she was reared by her grandmother, Mrs. Elizabeth Webber, who was numbered among the California pioneers of 1849, and was a native of Germany. Mrs. Strauch has three surviving brothers, John J. Wolfe, a farmer of Sacramento county; August Wolfe, also a resident of this county, and William T., of Placer county. Mr. and Mrs. Strauch have become the parents of four children, Lillian A., Davis D., and Ruby M. and Pearl M., twins. His entire life having been spent in this county, Mr. Strauch is well known amoung its citizens, and is held in uniform regard. The children of Gustave Anton & Henrietta W. (Gehrhardt) Strauch Mary W. STRAUCH b. 27 Dec. 1900, Sac. CA, d. 11 Oct 1990; m MACON. Carl Herman STRAUCH b.10 Nov 1904, Sac. CA, d. 1 Dec. 1985, Sac. CA; m 1st. Frieda Augusta WEISSE, 2nd. Maranda Mae. Wesley STRAUCH b. circa 1912, Sac. CA, d. before 1990; m Ardis P.
Vernon F. STRAUCH; m 1st. Mae, 2nd. Helen A. The children of August & Annie May (Strauch) Wolfe The family lived & all the children were born in Elverta. Mary M. Wolfe b. 1 Jan 1902; m Charles SCHEIDEL. Celia M. Wolfe b. 3 Feb. 1904; m Harold L. JORDAN. Richard V. Wolfe b. 1909; m Ada B. Prominent among the representative farmers of Sacramento county is August Wolfe, who owns and operates one hundred and fifty-two acres of rich land in the northern part of the county, where his entire life has been passed. He was born in Sacramento county November 20, 1874, a son of Joseph and Mary (Webber) Wolfe, the former of whom was a native of Germany, but the latter claimed Sacramento county as the place of her nativity. During his early youth August Wolfe was left an orphan by the death of his parents, and he thereafter found a home in the family of Mrs. Elizabeth Webber, a well known and honored pioneer lady of Sacramento county. He received his educational training in the public schools of his native community, but the knowledge which he therein received has been greatly supplemented as the years have passed by constant reading and observation until he has become a well educated and well informed man. He early became familiar with all the duties and labors that fall to the lot of the agriculturist, thus becoming well prepared to carry on farming on his own account at a later day, and he is now engaged in the cultivation of one hundred and fifty-two acres of arable land, planted to the crops best adapted to this climate, thus annually harvesting good crops as the reward of his labor. On the 21st of February, 1900, Mr. Wolfe was united in marriage with Miss Annie M. Strauch, a daughter of the late David Strauch of Sacramento county, and they have two children- Mary M. and Celia M. Mr.Wolfe is now serving as clerk of the board of trustees of the Oak Grove school district, he being a stanch friend of the public school system and of education in general. In his political views he is a Republican, but has never been an aspirant for the honors or emoluments of public office, preferring to devote his attention to the pleasures of the home and to his business affairs, in which he is meeting with creditable and gratifying success. note: all names, dates & places are from: International Genealogical Index: B#7929920. Martin & Catharina STRAUCH had a son Johann Jakob STRAUCH b. 1746 in Neuweiler, Rheinland, Preussen. Johann married Dorothea ZABIN. They had a son Conrad STRAUCH, b. 26 Oct 1776, Erlenbach, Pfalz, Bayern. He married 17 Apr. 1806 in Neustadt, Pfalz, Bayern to Barbara SCHRECK b. 5 Oct. 1780, Koenigsbach Neustadt Haardt, Pfalz, Bayern (parents: Eberhardt SCHRECK & Katharina WEINSCHENK). Conred & Barbara (SCHRECK) STRAUCH had a daughter Anna Catharina STRAUCH, b. 13 Jun. 1807, Neustadt, Pfalz, Bayern. She had a son David STRAUCH b.16 Dec. 1830, Bayern, Germany. David married Magdalena "Lena" MILLER. Joseph SCHEUER had a daughter Maria Magdalena SCHEUER, she married circa 1698 in Bayern to Johann Jacob KISSEL. They had a daughter Maria Christina KISSEL, she married 31 Mat 1745 in Neustadt, Pfaltz, Bayern, to Johan Georg KOCH. They had a son, Ehrhard KOCH b. 25 Apr. 1762 in Neustadt, Pfaltz, Bayern, he married Charlotta REDEBACH b. 1762 in Desloch Bei, Meisenheim, Rheinland, Preussen. They had a daughter, Amilia Luisa KOCH b. 17 October, 1791 in Neustadt, Pfaltz, Bayern, she married Johan Peter MUELLER b. 5 February 1797 in Kusel, Pfalz, Bayern. His mother was Anna Maria MUELLER.